Kamalashila Institute, the Karmapa’s seat in Lagenfeld, Germany, is located in an area connected with healing for hundreds and hundreds of years. In pre-Celtic times, it was a holy place for healers, who gathered here. There are also strong Christian connections. Just three kilometers below the village is a small chapel dedicated to Saint Jodokus (600CE to 668CE), the patron saint of hospitals, hospices, and farming. In a story similar to the Buddha’s, Jodokus was the eldest prince, next in line to rule the kingdom, but he renounced his heritage to live the life of an ascetic in the woods for eight years. Afterward he traveled widely and became famous in his lifetime for healing powers and good works. Centuries later, a duke from the Lagenfeld area was leaving for the Crusades. He made the commitment that if he came back alive, he would build a chapel for St. Jodokus. The duke did return, and to fulfill his promise, he began to construct a chapel to shelter a relic of the saint. The duke gathered stacks of wood and piles of stones near his castle. One day, a huge flood came and swept all the materials downstream. The duke took this as a sign that he should build the chapel in this new location, which turned out to be the one just below the present village of Lagenfeld. Even now, there is a famous pilgrimage to this lovely chapel every fall. Nearby, when the construction of Kamalashsila’s main buildings was finished, a large stupa containing a shrine inside was begun. The Karmapa was consulted about which statue to place on its altar. The list of suggestions included Shakyamuni Buddha, Tara, Chenrezik, and other popular deities, but not the Medicine Buddha as people were unaware of this piece of local history. When the Karmapa gave his answer, it came swiftly and clearly: the statue should be the Medicine Buddha. So the empowerment this afternoon continues along the lines of this ancient tradition. The central image on the shrine next to the Karmapa’s throne has been changed to a radiant blue Medicine Buddha. As on previous days, the Karmapa sat behind the carved screen to perform the preparations for an hour, giving the audience a rare chance to meditate in his presence. After taking his place on the throne and preparing the ground of the empowerment, the Karmapa paused to talk about the Medicine Buddha. The traditional healing methods of Tibet, he said, are closely related to the Buddha’s teachings in several ways. One is the investigation of causes, which are divided into the immediate and long-term. The immediate causes and conditions pertain to the body; for example, the elements have deteriorated or bacteria have invaded. However, if we go beyond attempts to cure a particular infection or operate on a tumor, we can discover the long-term causes. These are related to the mind and mental states, such as anger and attachment. All disease is a result of many interdependent causes and conditions, so it’s important to analyze the complex of these relationships. These days, we deal with a lot of pressures in our lives, which bring us stress. Numbers of people have difficulties with their mental and emotional states. Temporary relief is not enough here. To bring a more sustainable, deeper level of cure, we ourselves need to find ways of allowing our minds to be peaceful. The mind gives medicine to the mind; we need to use a mental medicine for our mental afflictions. A good way to begin is to make a connection with the Medicine Buddha, the King of Deep Blue light, through an empowerment, which the Karmapa then bestowed in full. The following day, the Karmapa will consecrate the stupa at Kamalashila, which enshrines a Medicine Buddha inside, thus reaffirming this connection with the center and providing a central focus for this practice. 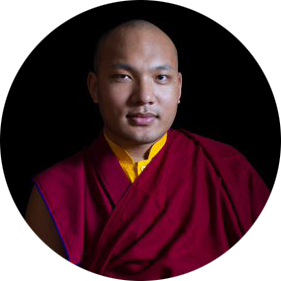 Afterward the Medicine Buddha empowerment, the Karmapa brought the teaching program to conclusion by saying, “Although it took many years, at last this visit happened, because we continued to have hopes and aspirations. This is the first time I could step onto the land of Europe. For a long time I couldn’t come here, and it was difficult for you to come to India. This time, I could only come to Germany, but many of you from the different countries of Europe could come here, and we have now established a meaningful relationship. I am very pleased about that.